Penelope is a multi-degree professional with 16 years of management and consulting experience, including time in the Australian Defence Force. Penelope’s operational, strategic, leadership and management skills have been repeatedly sought out by companies involved in high-risk industries including the construction, mining, oil and gas sectors, for projects around the world. In 2015, Penelope was named Chief Executive Officer of Energy Skills Queensland. Penelope is the Co-Founder and Chair of Women in Power, as well as the Chair of the Electrical Safety Education Committee. She is the winner of the 2016 Queensland Telstra Business Women’s Award for Social Enterprise and Not-For-Profit, the 2016 APAC CEO of the Year and the 2017 Women in Industry Mentor of the Year and Industry Advocate of the Year. A wicked sense of humor, exceptional learning agility, and the ability to reverse park an 8,500-tonne warship all ensure that Penelope stands out in every crowd. Can you tell our readers about your background? Some people know me as the woman who can reverse park a warship. Others may know me as the CEO of Energy Skills Queensland or a Co-Founder and Chairwoman of Women in Power. Friends know me as a dog loving champagne drinker, and family has saddled me with far too many terms of endearment, both rude and loving, for me to mention. Whatever I am called, I am a determined woman, keen to forge new paths in predominantly male-dominated industries, and a woman with a loud voice which is useful when speaking out for equality, diversity, and justice. I have been called a ‘true leader of people and operations’. I have been recognized as an innovator with unsurpassed drive and passion. I continue to receive accolades for my vision and entrepreneurship, including being named the 2016 Queensland Telstra Business Woman of the Year for the Social Enterprise and Not-for-Profit category. I am a sought after speaker and author and my compassionate nature and high level of emotional intelligence allow me to provide support to all stakeholders. What inspired you to start your business? Women in Power is a Not-For-Profit organization formed in 2015 whose original mission was to promote and improve the electrical and electrotechnology industry by the advancement of women within it. After an incredible amount of feedback, Women in Power is now no longer restricted to assisting those in the electrical and electrotechnology arenas and instead, is available to support any industry. Women in Power provides a forum for its members to meet and exchange information, ideas, and solutions and offers individual members an opportunity to expand personal and business networks, maintain awareness of industry developments, improve skills and knowledge, and make a contribution to other women in the industry. · Liaison with like-minded related associations. In late 2015, three incredible women and I met at an industry conference. At this conference, there was a distinct lack of female attendees, portraying a gender imbalance within the industries of electrical and electrotechnology. Collectively, we knew that something had to be done to ensure our workforces of the future were gender equal. Shortly after the conference, we conducted some desktop research into what was available for women in these industries. Quickly, we found that there was a distinct lack of organizations or initiatives whose aim was to empower and advance women in the electrotechnology industries, so we decided to fix this, and so Women in Power was born! Women in Power is an organization for women, by women. In saying this, we recently received our first request from a gentleman in another state for mentoring! Where is your business based? Women in Power is based in Brisbane in Queensland, but our services are not restricted to Queensland. Our coaching and mentoring services are now provided internationally and we regularly run events and workshops to provide professional development for women in all industries. How did you start your business? What were the first steps you took? 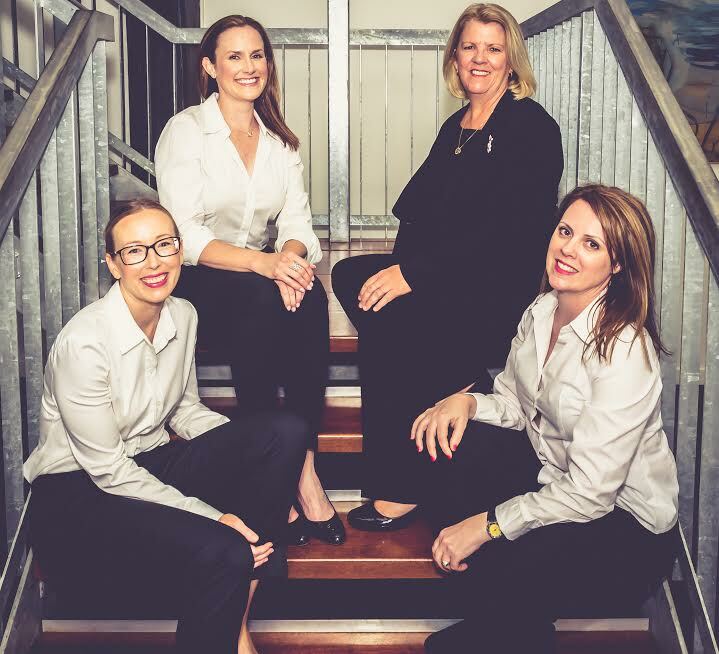 Women in Power is the collective effort of the four founding members, each of which is a senior executive female within the electrotechnology and electrical industries. Initially, we conducted desktop research to ensure that what we wanted to achieve was not already being provided…we are a complimentary service to industry and other like-minded organizations. We do not want to reinvent what already exists! Once the desktop research was completed, it was a case of understanding what our key drivers were, our main values and mission and subsequently setting up the organization from a business perspective. What has been the most effective way of raising awareness for your business? The four founding members of Women in Power are senior executives within the original industries that we represent so the most effective way for us to initially raise awareness was by word of mouth. After this, it was directed meetings with dedicated industry stakeholders as well as a range of marketing activities. An important requirement for the women involved in the organization was the need to tailor our awareness-raising activities to suit operational requirements. Currently, all the work conducted within Women in Power is provided on a volunteer basis – every single member involved has a ‘day job’ outside of the organization. In the near future, we would love to see Women in Power being able to provide 24/7 support with full-time staff and an increase in products and services. How do you stay focused? In a world of competing demands, it is difficult for any person to remain focused on just one task. Due to the passion and dedication of the founders of Women on Power, it is easy for us to focus on our vision and mission as we want to leave a legacy of empowering people to be the biggest and best versions of themselves. We all have a lot on our plate. Staying focused can be tough with a constant stream of employees, clients, emails, and phone calls demanding your attention. Amid the noise, understanding your brain’s limitations and working around them can improve focus and increase productivity. Our brains are finely attuned to distraction, so today's digital environment makes it especially hard to focus. Simple things that assist us to remain focused are doing creative work first, allocating time deliberately, and training our mind like a muscle so multitasking can be achieved. How do you differentiate your business from the competition? Women in Power do not see ‘competition’; we see opportunities for collaboration and innovation. We are a complimentary service to industry and other like-minded organizations. We do not want to reinvent what already exists! What's your best piece of advice for aspiring and new entrepreneurs? Realize that building a business is a HUGE time commitment. By starting a business, you have made a decision that does not allow you any time, in your first year, to do anything but build your business. Gone are the days where you attended late night parties, or spent periods of time binge-watching the newest TV show. Every minute needs to be allocated to your business. It’s a substantial sacrifice and you have to realise the level of commitment required. Be practical about your money. The importance of generating money and managing profits is key to any new business. Focus on the present financial needs and building the actual company rather than thinking about how much money you will make years from now. Hold Yourself to Your Word. Your word is bond. If you make a commitment, no matter what happens, you have to deliver. Not only is your business’s brand at stake, but your personal brand and reputation, too. Poor business decisions could put your entrepreneur status at risk. What's your favorite app, blog, and book? Why? One of my favorite app is CamCard which allows me to scan, manage, sync and exchange business cards with ease. I also like Evernote as it allows me to collect notes from anywhere, on almost anything. I also like any audio book apps as it allows me to listen to audio books if I am driving, cooking or walking. I don’t read blogs as I have online subscriptions to the Guardian and the New York Times. I also enjoy keeping up-to-date with key topics via LinkedIn. I use books for escapism and relaxation so anything written by authors like Lee Child and Harlen Coben are great! Outside of this, I read many ‘self-help’ books like those authored by Mark Manson, Tony Robbins, Malcolm Gladwell, Stephen Covey, Eckhart Tolle and more. What's your favorite business tool or resource? Why? By 'favorite' - do you mean - most likable or most useful? Either way, I am not sure I can identify just one business tool or resource which is my favorite! For me, personally, MS Office tools are a must, even though many people fail to mention them - perhaps because we consider them essential. I use LinkedIn hugely. LinkedIn is a social network for professionals and allows anybody and everybody who is interested in taking their professional lives seriously by finding new opportunities to grow their careers and to connect with other professionals. I also use CRM (or lead generation tools) to manage and analyze customer interactions and data throughout the customer lifecycle, with the goal of improving business relationships with customers, assisting in customer retention and driving sales growth. I also love Paypal.com as it is the faster, safer way to pay online without sharing financial details, send and receive money or accept credit and debit cards as a seller. Who is your business role model? Why? I must acknowledge two of the greatest entrepreneurs I’ve ever known. These entrepreneurs have been my greatest source of inspiration; these entrepreneurs are none other than my beloved parents, Alison and Michael Twemlow. My parents laid the blueprints for my behavior since I was young, and provided me with the instinct and drive to be the biggest and best version of myself I can be. · Richard Branson (Virgin): his competitive spirit and resilience inspire me to take on the giants unafraid. · Henry Ford (Ford Motors): he taught me how to fail without failing; he taught me that failure is just a resting place and he proved it by going from two major business failures to becoming one of the richest men in the world. · Steve Jobs (Apple): his transformative and innovative abilities and spirit allow me to push myself to think outside the box. · Indra Nooyi (PepsiCo): her ability to lead a company to record financial results whilst making stride to move PepsiCo in a healthier direction takes courage. · Larry Page (Google): another example of a businessperson who can persevere any challenge. Larry and his company have faced much criticism and received ample praise over the years for their actions. But in the midst of the storm, he has never let what others think to sway him from pursuing the course for his company that he considers the best. · Howard Schultz (Starbucks): From his upbringing in a poor family in the Bronx to an athletic scholarship and eventually the head of Starbucks, Howard Schultz is a consummate example of courage, hard work, and the ability to achieve the American dream. How can our readers connect with you?